For more photos, you need to open the Album. Dr. Narayan B. Iyer, National Co-ordinator, IDF, called on a couple of schools in Sikar District in Rajasthan on 25th July 08. IDF received an overwhelming support from the schools in Sikar. Thus, the headlines.......Sikar soccours seeker. Rotarian Mr. Balwant Singh Chirana, Director of Vidya Bharti Public School in Sikar, Rajasthan appreciated the work of IDF and extended all support for its humanitarian programmes. Mrs. Renu Sehgal, Principal, Mody School, Lakshmangarh, Sikar, Rajasthan receiving Joint Action. Mody School supports IDF work. Col. (Dr.) P. C. Sharma (Retd), Director of Nimawat Public School, Fatehpur - Shekhawati, District Sikar, Rajasthan appreciated the work of IDF and extends support to its humanitarian programmes. Dr. Ashok Kapil, Manager Administration, Goenka Institute of Education & Research, Lakshmangarh Road, Sikar, Rajasthan extends support to IDF's projects. IDF's Bal Gurukuls will certainly benefit the underprivileged children staying in slums and help in empowering them as they grow, said Rev. Fr. Maria Gregory. Bal Gurukuls are a god given opportunity for the needy and the underprivileged children to excel in their lives, expressed Fr. Gregory. Rev. Fr. Maria Gregory, Secretary of Bangalore Catholic Diocesan Schools inaugurated Mary Immaculate Bal Gurukul, an empowerment class programme of Indian Development Foundation and The Sisters of Mary Immaculate of Bishop Marrow at Benson Cross Road, Bangalore on 22nd July. A good number of children from neighbouring colonies and slums in Benson Road will benefit fr om this Gurukul, he said. Bal Gurukuls are the Empowerment Class programme initiated by Indian Development Foundation (IDF) to provides learning skills and creative arts to the poor and the needy. IDF has so far established 16 Bal Gurukuls in different parts of the country and Mary Bal Gurukul is 17th in the row and 4th in Karnataka. We plan to increase the number of Bal Gurukuls to 25 as we are celebrating the silver jubilee year, observed Dr. S. Franklin, Area Manager of IDF. Mr. Sai Ranga Rao, Principal of Kendriya Vidyalaya, Pune lauded the efforts of Indian Development Foundation in health, education and rural development programmes. I was happy to be associate with IDF during my tenure in Kendriya Vidyalaya, MEG & Centre, Bangalore and I will continue supporting the social responsibility programmes of IDF, he expressed. Bubbling Karan Dravid, a class 4 student of Kendriya Vidyalaya, MEG & Centre, Bangalore and IDF's youngest social Ambassador felt happy to be part of the inauguration function. Every student must work hard and study well to become important persons in life, Karan said. We should grab all the opportunities given by the teachers in Bal Gurukul and learn good things in life. Be a good student in the Gurukul and a good child to your parents, Karan pointed out with a smile. Later Karan mingled with the students and taught them basic English and Maths. He also played with the students and gave them some tips of being happy. Earlier Sr. Vincenta of Mary Immaculate Convent welcomed the children and the guests while Sr. Caroline, Provincial, Sisters of Mary Immaculate of Bishop Marrow proposed a vote of thanks. 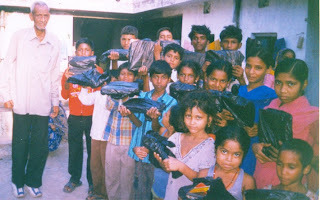 Indian Development Foundation in collaboration Patuck Gala College organised `Guru Poornima' at Vimala Dermatological Centre, Versova, Yari Road, Andheri (W), Mumbai 400 061 on Friday the 18th July 2008. Guru Poornima is the day to expresses ones gratitude to ones Guru. We felt happ y felicitating the Social Guru Rev. Sr. Bertilla and Management Guru Dr.A.R.K. Pillai for their splendid contributions for over three decades to the humanitarian causes, expressed the students of Patuck Gala College. The students from Patuck Gala College, Vakola had put up colourful skits with theme on the importance GURU in modern days. The event was organised by the students of Patuck Gala College to reach-out the inmates in th e Centre and share happiness and joy on the auspicious occasion. Prof. K.G.K. Kurup, Administrator, Patuck Polytechnic Trust presided over the function while Prof. Meeta Seta, faculty from the College co-ordinated the event. More students should come forward and participate in such social resonsibility programmes, said Prof.Kurup. Dr. Mrs. Pathak, Principal of Patuck Gala College led a group of 60 students from her college to Vimala Centre to celebrate Guru Poornima in a different manner. We all felt very happy to come to Vimala Centre and meet Sr.Bertilla and Dr.Pillai. We could feel the pulse of Veda Vyas on seeing these two luminaries, expressed Dr.Pathak. Dr. Narayan B. Iyer, Co-ordinator of IDF congratulated the students for coming forward to participate in the event and making it a colourful one. Guru plays an important role in everyone's life and we need to venerate our guru for showing us the correct path in our life, said Dr.Iyer. Prof. Sawant from Patuck College and Mr. Sanjay S. Waghmare from IDF co-ordinated the event. The children and inmates of Vimala Dermatological Centre felt happy to witness such a meaningful programme which will be ever cherished in the days to come. 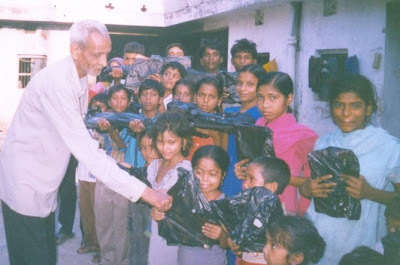 Responding to the appeal received from Mr.Thomas, General Secretary, Kusht Niwaran Society, Patna, Bihar for supporting a couple of children staying in Sitamari leprosy colony, Indian Development Foundation felt happy in providing the required educational materials. The children and people in Sitamari leprosy colony are indeed happy to receive educational materials from Indian Development Foundation, Mr. Thomas quoted. The children from the colony send their thanks and greetings to the supporters of IDF, he said. The students need to go to school regularly and study well. We congratulate Mr. Thomas from KNS for taking initiative in providing basic requirements to the children staying in the leprosy colony, Dr. Pillai said. IDF is committed to support the underprivileged children in the society, he said. You support, we do the rest ! IDF's multi-lingual TB poster issued on World TB Day found a place in StopTB site. Join hands with IDF to Stop TB. The top three state ranks in Tamil Nadu for the March 2008 Class X examination were from Tirunelveli town. Ms. R. Ram Ambikai from St. Ignatius Convent Hr. Sec. 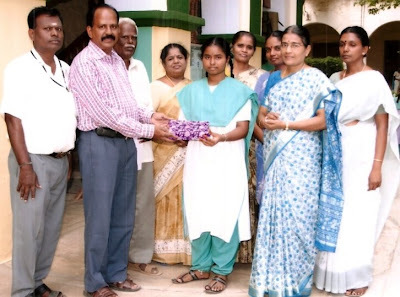 School, Palayamkottai topped the list scoring 496 out of 500 marks. Indian Development Foundation honoured Ms. R. Ram Ambikai for the excellent performance. Mr. C. Chidambaram, Manager-Southern Region, IDF congratulated Ram Ambikai for scoring 496 marks out of 500. Ram Ambikai has become a role model for several students in the state. In addition to producing students with excellent academic qualities, the school has also been participating in leprosy/ TB programmes of IDF, Mr. Chidambaram expressed. My Principal and my teachers gave excellent support and encouragement to prepare for the exam in a systematic manner. My parents too played an important role. I am grateful to God Almighty for bringing this laurel to me, expresed Ram Ambikai with a smile. The Principal appreciated the efforts of Ram Ambikai and congratulated her for achieving the 1st position in the state. It is really a creditable effort from her part and for bringing glory to her school. Mr. S. Arumainayagam, Voluntary Officer of IDF present at the event congratulated Ram Ambikai and wished her all success. IDF team presented cash award and a couple of books in the presence of students. Ram Ambikai thanked IDF for the wonderful presentation and wished every success in its national efforts. St. Ignatius Convent Hr. Sec. School, Palayamkottai has been a great supporter of leprosy/ TB programmes of IDF for several years. Incidentally, the school had also bagged the most prestigious Mother Teresa Memorial Award 2006-07 for excellent participation in social responsibility programme in Tamil Nadu. The award instituted by Indian Development Foundation was presented on 4th October 2007 at Chennai. Indian Development Foundation has been supporting the visually challenged persons associated with our project. The visually challenged persons are trained and developed in different trades which makes them self-reliant. We wish to present a few Sewing Machines to the blind home connected with us. More sewing machines means giving more training to the differently-abled persons. Cost per sewing machine is Rs.5,500/=. You can contribute your mite for a noble cause. Patuck Technical High School & Jr. College organised an event to falicitate the peak performers of the Class X examination on 4th July at the School auditorium in Vakola, Mumbai. Dr. A.R.K. Pillai, President, IDF was the Chief Guest for the function. He congratulated the students who won the prizes for their excellent academic performance. He reminded the students about the story of Dr.Kalam who with determination and dedication has come up to the peak of his life. Everything is possible. The students need to set their goals at early age and work for it, Dr. Pillai said. Prof. K.G.K. Kurup, Administrator, Patuck Technical Trust appreciated the star students and wished them well in their career. He also addressed the current year's batch to take cue from the winners. Presenting cash awards to the winning students, the Senior Manager of Canara Bank, Vakola Branch gave the students tips for banking and finance. Mr. Adil Patuck, Chairman and Mr. M.K. Kumbhar, Headmaster of the School and members of the School Committee expressed their jubiliant feelings. Sneha, Deepak and Nisha - the top three winners of Patuck. Every year, an estimated 4.9 lakh new MDR-TB cases occur causing 1.3 lakh deaths. It fell to 5% in 2006.